New technologies of computational design and digital fabrication have opened up enormous possibilities for architects, as seen in the proliferation of exuberant forms, richly patterned facades, and increasingly comprehensive building information models that proliferate throughout contemporary architecture. And yet, there remains a gulf between the promise of these technologies and the day-to-day realities of architectural practice, much of which remains resistant to alternative modes of design and construction. This series of full-scale facade prototypes was produced in an advanced Integrated Building Design studio taught by Adam Marcus, Margaret Ikeda, and Evan Jones at California College of the Arts. The studio explored ways of bridging this disconnect by seeking opportunities to leverage digital fabrication technologies in a strategic, limited, and focused manner. This research seeks pragmatic ways for such technologies to interface with existing paradigms of construction, rather than purely speculative ones. The studio was run in conjunction with a residency at the Autodesk / Instructables Pier 9 Workshop in San Francisco. 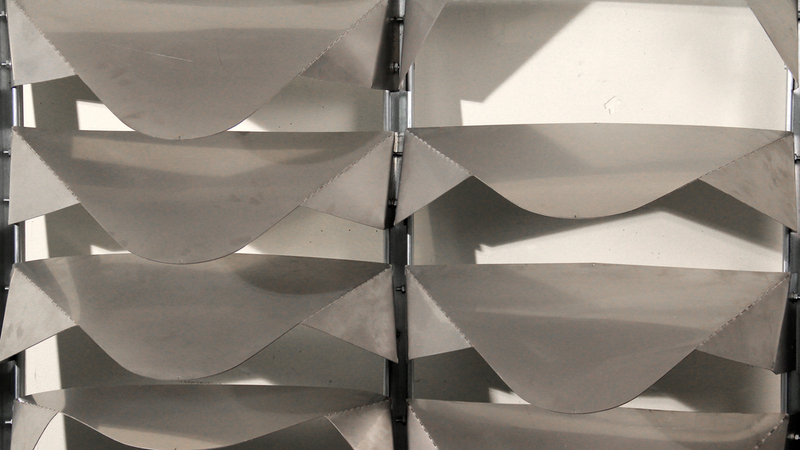 Instructors and students collaborated with the workshop to produce a series of full-scale envelope prototypes from 18 ga. steel that demonstrate comprehensive understanding of performance, detailing, and assembly. The focus on the building envelope challenged students to embed material systems with intelligent behaviors derived from program, performance criteria, and experiential quality. See this link for Instructables documenting the design and fabrication of each prototype.